We’ve got two great matchups on the docket this Friday for the Frozen Four semifinals: No. 1 Wisconsin vs. No. 4 Clarkson, and No. 2 Minnesota vs. Cornell. Here’s a look at both games, keys for each team, and players to watch. This is a rematch of the 2017 NCAA title game, which saw the Golden Knights unseat the favored Badgers in a 3-0 shutout. Clarkson is of course defending their national championship for the third year in a row, while the Badgers are trying to win their first since 2011. For Wisconsin, I think there’s a pretty simple but major key here: the transition game. The Badgers themselves transition pretty well, but it’s critical that they don’t give up much to the Golden Knights, specifically Loren Gabel and Elizabeth Giguère. They’re both absolutely lethal off the rush and can make the best of defenders look out of their element. And I think Wisconsin needs to capitalize on its quality chances. Kassidy Sauvé is really good in goal for Clarkson, and she’s used to handling a hefty workload. The Badgers can’t make it easy for her; they’ve got to be buzzing around her and make some creative plays to get better looks. On Clarkson’s end, they’ll want their top players coming through in this one. Gabel and Giguère have been on the ice for virtually every critical moment in Clarkson’s playoff run so far: both goals against Colgate in the ECAC semis, the first two goals against Cornell in the ECAC championship, the tying goal against BC last weekend, and, of course, the overtime winner in that quarterfinal, too. For as much of an impact as they’re making, I wonder about who will come through if Wisconsin successfully shuts them down. Generating offense throughout the lineup should be a focus, as always at this stage in the season against a quality opponent. Mekenzie Steffen, D: I would imagine Steffen’s pairing will see a ton of time against the Gabel line, and she in particular is a player that can help get possession going back Wisconsin’s way in those situations. Annie Pankowski, F: Pankowski has come through in a big way throughout the playoffs for Wisconsin, and she’ll be counted on as a leader to produce again this weekend. T.T. Cianfarano, F: When you think about players who’ll come through if the top line is held back, Cianfarano has got to be top of the list. She has really good scoring instincts and the ability to break a game. Ella Shelton, D, and Taylor Turnquist, D: This pairing was especially great in the ECAC championship game against Cornell. The Badgers like to have the puck and generally do for most of the game, but these two will have a say in exactly what they can do with it, and how long they can keep it in the offensive end. Though Minnesota is probably a big favorite here against the only low seed to advance to the Frozen Four, I wouldn’t count the Big Red out. 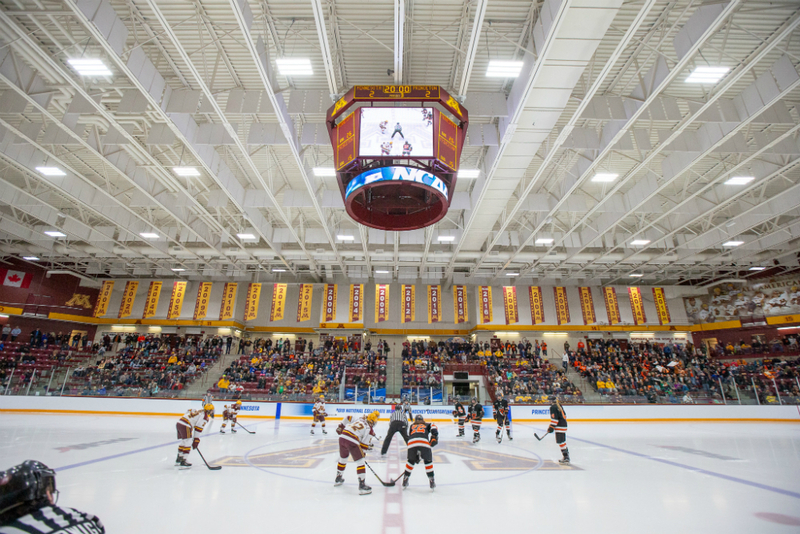 The Gophers were locked into a tight battle against Princeton last weekend, who Cornell knocked out of the ECAC Tournament. The Big Red play a pretty structured game, and they’ve got some notable players up front who can wreak some havoc. Where Princeton was successful last weekend, I think, was in using their speed to match the Gophers’ own attack and create problems defensively. Cornell’s top-six group could certainly do the same here. They’ve also got a really strong defense that’s played well all postseason, barring a couple of errors against Loren Gabel and co. Their blue line needs to continue making good reads offensively and getting the puck out of the zone quickly. What was interesting to me about Minnesota’s win last weekend was that one single line made all the difference. For most of the season, they’ve relied on superior depth, and the ability of all of their lines to threaten offensively. But that was not the case against Princeton. All three goals were scored by Kelly Pannek, Sarah Potomak, and Amy Potomak. This isn’t to say the rest of their team was ineffective at all, and that line is obviously outstanding no matter what, but I’d expect a few more people to be involved on the scoresheet against Cornell. And I’d be really curious to see what happens if the production is reduced to just one line again. Pots and Pan: This, by the way, is the amazing nickname given to the Potomaks and Pannek. There is so much talent between these three players, and so much creativity and offensive awareness, too. I think they’ll continue making a difference in Hamden. Kristin O’Neill, F: If Cornell is going to win this game with speed, that’s probably going to start with O’Neill. She’s a leader for the Big Red in all aspects and can really get things going when her feet are moving. Second and third D pairings: It’s hard to really say who’s the “top” pairing between Micah Zandee-Hart and Kendra Nealey, and Jaime Bourbonnais and Willow Slobodzian. But I think there was a marked difference between the play of the top pairing and the play of the second pairing for Princeton last weekend (not a knock on any of their D, just a testament to how strong Claire Thompson and Sylvie Wallin were). If Cornell can avoid any kind of drop-off and keep all of their pairings in sync, it’ll prevent another standout game from the Pots and Pan trio, or any other Gophers.